Art Every Day Month is next month! I hope you're excited! Ways to share: Once you've signed up, you can leave a comment on this post and/or use the "Mr. Linky" widget below to link to a blog post(s) about your creative activities during the days of 10/1/12 - 10/7/12. Theme: The (totally optional) theme for October is Trees. You can read more about the optional theme here. Excited? I have been gathering my papers and posting schedules on the diningroom wall already!!! My only regret is having seen the sign in post too late. This time around I wasn´t the first (after you) to be there. I am so looking forward to stretching myself with art!! Thanks for hosting such a great challenge. I too am looking forward to the challenge! I had so much fun last year, even though I stressed out a bit too. But I have plans for lots of small art, so hopefully that will keep me creating in my studio! Happy Autumn everyone! So pleased with the October theme – trees. I don’t know why, but all my life I’ve sketched, doodled, drawn, painted and stitched pictures of trees. Now I have the perfect excuse! A slow week for me. I prepared a background canvas in preparation for Art Every Day Month. Oooooooh, I love Trees — and they are soooo very special to me;) I actually love trying to draw them, too, and making some yummy Elixirs, which in fact the first one I’ll be making again this Fall will be with our White Pine Tree Needles! I forgot to leave a comment yesterday…sorry! I have just joined up for the November AEDM..hope that’s ok? Best wishes to you and see you every day next month. 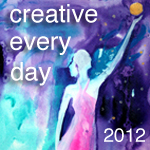 I have just joined the Creative Every Day Challenge. Through Art Journalling my creative juices have started flowing. I have become open and willing to try. My ‘blank paper’ fear syndrome has gone. I have open to impressions of sight and sound, texture and smell for sometime as I breed Russian Blue cats and to do this successfully you must learn to be observant to the feelings and behaviour of animals as they can’t ‘talk’ to you. I forgot to check the theme….but butterflies do inhabit trees, so I am sort of OK here. Only a month until another AEDM – where did that year go? I love trees so this month’s theme is a pleasure. But first I’ve posted a couple of art journal pages with a new mandala. I haven’t blogged in over a month, for unavoidable reasons, but am glad to be back. Wishing you all a happy & creative week! I’m delighted to say that I attended the SoulCollage® facilitator training this past weekend and can now begin facilitating this wonderful, intuitive collage process myself! I wrote about the weekend, and the journey that SoulCollage® helped me to take, on this week’s post. thanks for hosting ! Happy creative week ! I had not checked the theme for the month. I was delighted to find it was trees. They have been cropping up everywhere for me, I have been enjoying #treetuesday currated by +Christina Lawrie +Shannon S. Myers over on Google+. So great to “see” y’all! I have had AEDM on my mind so much lately. I even prompted in twitter using the hashtag #AEDM2012. Hope that’s ok!